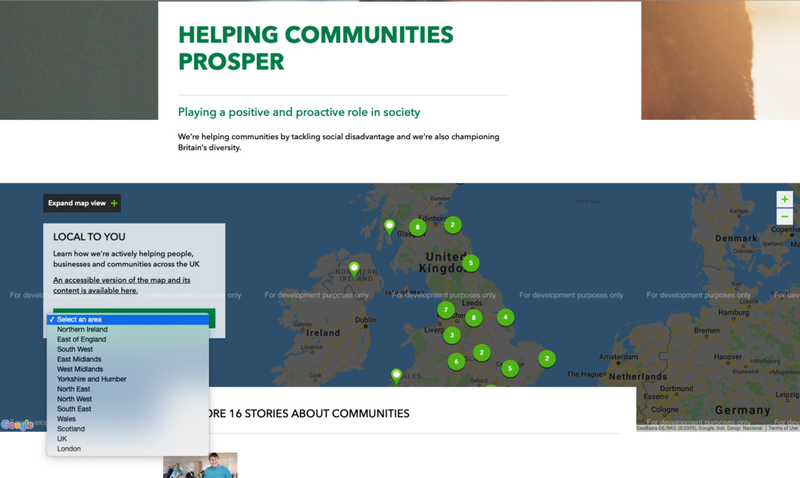 The UK banking group’s corporate website has a ‘Helping Communities’ sub-section of its ‘Our Purpose’ primary section. It houses an interactive Google map. Visitors can use a dropdown menu, or click on icons on the map, to find case studies on how the bank is ‘helping people, businesses and communities across the UK’. The case studies include pull-quotes from beneficiaries of the project; large photographs of the people involved; and summary facts and figures relating to Lloyds’ total contributions to similar projects across the UK. Lloyds’ interactive tool is designed to enable visitors to read about projects close to where they live. This is likely to make the bank’s CSR communications more ‘relatable’ to many visitors.Moreover, the map within the tool indicates each CSR project in the form of an icon. This provides even fleeting visitors with a striking visual summary of the breadth of Lloyd’s CSR projects around the UK. The execution of this tool has room for improvement. For example, the interactive map is overly obscured by a boxy page layout. But the concept is sound – and could be usefully adapted for use on other corporate sites.